On a flight back to Reno from Tampa, Florida we upgraded to first class. 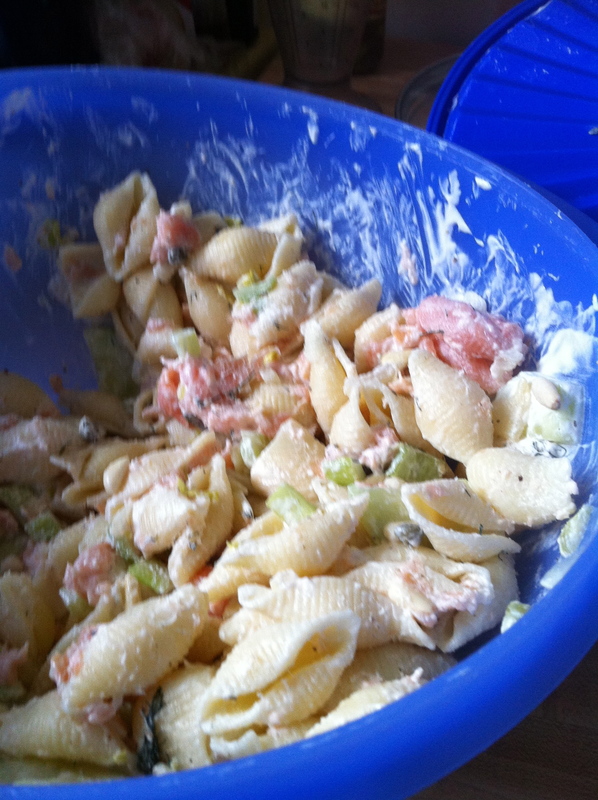 I had the most delicious pasta salad I had ever tasted. I’ve tried for years to copy this dish and I think I have it down. Richard and I always laugh as we remember the Seinfeld episode when Jerry flew first class and Elaine flew coach. I love sewing, machine embroidery, cooking, photography and MAC's. I love my iPhone. I have a beautiful chinese sharpei named Chole. I'm happily married to my best friend. I have a wonderful son named Bart who is a LCSW, that I'm very proud of. I am a Christian. I have a Nikon D300S and an Olympus 510 along with a few other point and shoot camera's. I love my Bernina 830 sewing machine. This entry was posted in food, General Life Stuff, recipes and tagged airline, Cheese, Cooking, Costco, Fish and Seafood, Food, Home, Pasta, Pasta salad, Pita, Recipes, Salad, Salmon, Seinfeld, Smoked Salmon, Tablespoon. Bookmark the permalink. Kuby, thank you for posting this. I love this salad and now I can make it. It is every bit as good as your picture makes it look. Bless you! made something. It sounds so easy. 🙂 Thanks!